The refugee debate has dramatically shifted in Australia – it is possible that the camps might be cleared on Nauru and Manus Island. We might actually see the concentration camps that Australia runs – closed. What has made this happen? This is no quick, fast battle. The movement exploded in 2001 in response to the so called “Tampa Crisis.” There were big rallies, over the following ten years there was some movement inside the major parties – but then momentum swung back to a policy of overseas detention. Bipartisan support for Nauru and Manus made it seem impossible that things could change. Yet the movement stood defiant. Groups acted in different ways – the Refugee Action Coalition kept up public opposition through demonstration. Support groups for refugees provided strong advocacy. Community organising groups slowly built support amongst those who haven’t previously been engaged, in places like Western Sydney. Digital organising groups like GetUp provided opportunities for mainstream support – including visiting Manus to show people what it was like. 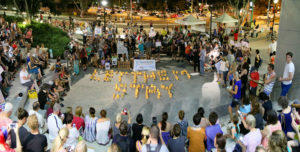 The refugee movement has been the anchor that has achieved this recent step – where polls have shifted, and refugees are being brought to Australia from Nauru. These persistent heroes of the refugee movement are the people we need to thank. The refugee movement built strategic allies, some in the major parties, but the most powerful ones were amongst the independent members of parliament. These have been particularly strategic as the government’s majority has been so slim. Cathy McGowan has been a strong advocate for bringing refugees here. Then, when the seat of Wentworth opened up – it became a powerful space for changing the debate. Kerryn Phelps argued that she wanted her campaign to change the debate on refugees. And it did. But we must remember that she is from the movement right back in 2001. Back then she was a leading civil society figure, head of the Australian Medical Association, horrified at the original attacks on refugees staged by John Howard. The refugee movement shaped Kerryn Phelps – and on this issue she was a candidate that sought to serve those movement goals. This has been one of the hardest battles in Australian social movement history. It has not just been a movement for refugees, but against Islamophobia, and also against fear – economic insecurity – that is blamed on refugees. Moving forward on such a tough issue requires that you to have some wins along the way. The 2016 Baby Asha campaign – where an injured child was saved from being returned to Nauru was the first remarkable victory (ChangeMakers told that story in Series 1, Episode 5). Victories like this demonstrate that collective action works, and in doing so built the movement. Community organisers in Sydney used that approach to win improvements for refugees here – travel concession cards, free access to TAFE, childcare. Victories showed that a different kind of policy – a kinder compassionate policy – was possible. When you are deep in a social movement it often feels like nothing will change. You work hard, but you are never sure that it will amount to anything. Then over the past month, so much has changed. Refugees were the topic of an election and the focus was on caring for them. A major demonstration pushed that feeling forward. Polling shifted. Public debate changed. The reassuring thing is that all issues change, eventually. Even this one. The truth is that people do care about others – the challenge is how to make progressive issues sufficiently important and urgent to be in their immediate interests. To be above the noise. Life is tough for most people and it’s hard for people to engage in issues beyond the day to day. But it is not impossible. The refugee movement gives us hope about how hard change can be shifted. There is so much more to be won, in this space and others. But it can be won – because if this issue can shift – it shows how we can make so much in our world better. Amanda Tattersall is the Host of ChangeMakers Podcast, Series Two is out 29 October. A long time ago she co-founded Labor for Refugees.